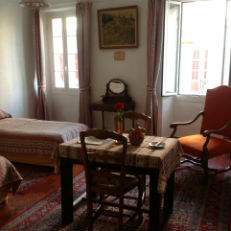 The hotel provides 6 non-smoking rooms named from famous painters. 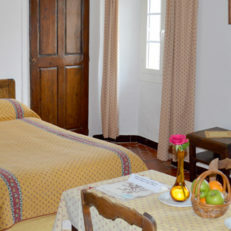 Each room is fit out with a private bathroom with shower and a table with chairs. Beautiful visible beams, floor-tiles and wood furniture harmoniously make up this authentic decoration. 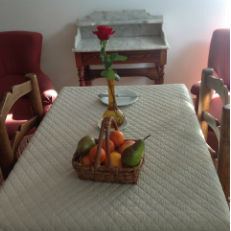 Seasonal fruits and fresh flowers welcome each new guest. 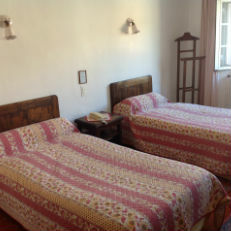 Few rooms are located on the back side of our property with an old city roofs view; others rooms offer a mountains view. *Preferential rate applicable for a reservation of several nights or several rooms. Join us for a pleasant stay: enjoy your stay in our establishment to discover the beauty of the surroundings of Vence or taste our seasonal menus! Go to our Facebook page to see our news!